Saving one of these files or all of them on your Desktop area is a great idea. When you go to work on the resume, the location makes it very easy for you finding it because who really wants to look all through their computer trying to find a file. It's just handy. 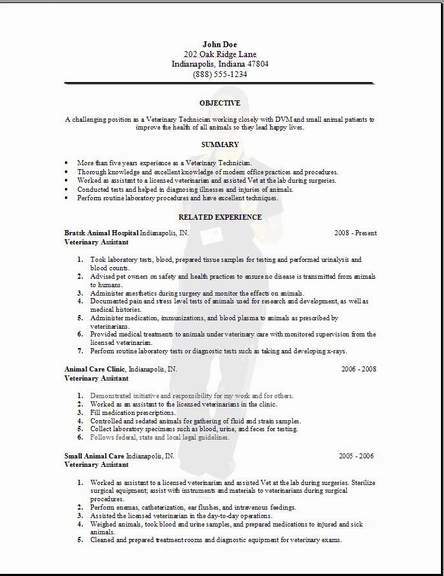 We are giving you 3 of our very best resume formats people wish to have for creating a nice looking resume. Getting started is the hard part, but we know it is easy to complete one of our examples in only minutes. Get your information out and have it all right next to you before you start. 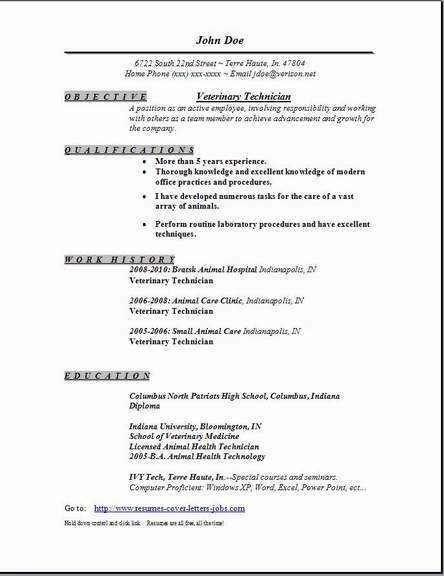 Yes, that's why you are here, so you can edit this resume with your own information, you can get a better idea of the look and feel of it. 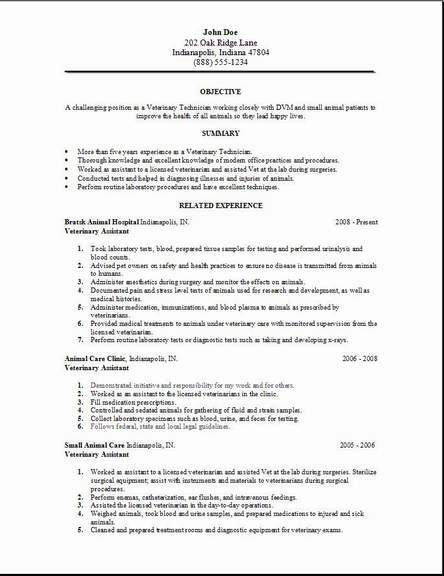 Discover these free veterinary technician resumes and make them useful for yourself. All it takes is a small amount of your time to get it completed. Veterinary technologists and technicians will conduct clinical procedures under the supervision of a licensed veterinarian. They will also perform a vast array of medical tests and then diagnose medical conditions and diseases in animals. As an example, they will perform laboratory tests like urinalysis and blood counts, prepare animal tissue samples, take blood samples, or they will assist the Veterinarian in completing a variety of tests and analyses where they are using quite a few different items of medical equipment, like test tubes and many types of diagnostic equipment. Most of their duties are performed in a highly technical laboratory setting, a few are not. For an example, veterinary technicians will obtain and record the patients’ case history, expose and then develop x rays, and also provide specialized nursing care for the animal. Experienced veterinary technicians will discuss a pet’s condition with its owners and help to train new clinical personnel. Although their main work place is in private clinics and animal hospitals, veterinary technicians might also work in research facilities, there they will administer medications orally or topically, help to prepare the samples for laboratory examinations, and also record information on an animal’s diet, weight, what medications they are taking, their food intake, and evaluate what signs of pain and distress the animal may have. Working at research facilities, veterinary technologists will work under the guidance of Veterinarians or in some cases physicians. Most technicians love animals and get great self satisfaction from working with and helping other customers pets. Some of the work will likely be unpleasant at times, physically and emotionally demanding, and at times could be a little dangerous. Veterinary technicians will clean cages and lift, hold, or help restrain animals, therefore they have the exposure and risk getting bitten or scratched. So technicians need to take quite a few precautions when treating and working with the animals by using germicides or insecticides. Also the work setting can be very noisy. This is a very rewarding job that people really love.